Mirabelle is more subtle than Miracle, and is actually more rare. Thanks to Elena for suggesting her daughter’s name as our Baby Name of the Day. Our word miracle comes from the Latin mirabilis. Poet John Dryden penned Annus Mirabilis in 1667 to refer to the events of the prior year. Here’s the thing, though – 1666 was a year packed with disasters, including the Great Fire of London. However, there were several military victories, and, of course, the fire was extinguished and the city rebuilt. So Dryden’s “Year of Wonders” or “Year of Miracles” entered into the common parlance. There have been other years referred to by the term since. It makes the name virtuous and bold, but unless you’re a Latin scholar, the link isn’t immediately obvious. The name has never appeared in the US Top 1000. Cousin Maribel debuted in 1961, but has never topped the charts. But this name has history aplenty. It was used in the Middle Ages. The Dictionary of Medieval Names from European Sources includes an entry for Mirabel. It’s a masculine nam win popular seventeenth century comedy, The Wild Goose Chase. A man named Mirabeau was president of Texas in the 1830s. Other forms of the name abound. It’s a place name, too. The Crusaders built a castle in Israel by the name. The ruins are part of national park Migdal Afek. It can be found on the map in France and Spain, Canada and Austria. Even if you’ve never heard of Mirabell Palace, you’ve almost certainly seen it. The Salzburg historic site was also the location for several scenes from The Sound of Music. If you love edible names like Clementine and Olive, this name might be for you. That’s because Mirabelle is also a type of plum. Despite the association between plums and the color purple, this variety is a dark yellow color. They’re popular for making jam and tarts, as well as brandy. In the Northern Hemisphere, they’re in season from July to the middle of September, making this a seasonal choice for a late summer baby. Of course, the reason this name is under discussion has little to do with palaces or plums. It’s all about the belles and the elles. With Isabella, Annabelle, and Gabrielle in favor in recent years, plenty of other names with similar ending sounds have caught on. Think Ella, Stella, Bella, Brielle, Arabella, Aubrielle, and so on. In fact, Mirabelle is on the rise. 99 girls were given the name in 2015 – a new high. But that’s still not enough to put this name in the Top 1000. You might also think of a character in Enid Blyton’s St. Clare’s series, a friend to twin sisters Patricia and Isabel. It’s the name of the lost little girl’s doll in Gone, Baby, Gone, which turns out to be a major plot point. In 2005, Claire Danes played by a character by the name in Shopgirl. Mirabella was a woman’s magazine in the 1990s, created by Vogue alum Grace Mirabella. Speaking of Grace, she’s not the only one to bear this surname. It has a slightly different origin as a surname: the place name formed from the Latin mira – view, plus bella – beautiful. If you love the idea of a name that ends in -belle, but would like a name less common than Isabella or Annabelle, this is a gorgeous rarity that would wear well. What do you think of Mirabelle? Would you consider it for a daughter? This post was originally published on December 7, 2010. It was substantially revised and re-posted on May 23, 2016. I’ve always had kind of an unfair grudge against Mirabel/Mirabelle, since people always seem to see the Mirab- bit in Mirabai and then just assume that the rest is -bel or -belle. Which it… Just… Isn’t. (Mirabai/Meerabai/Meera Bai) is an etymologically unrelated name from Rajasthan; my parents were hippies, which is why a white girl like me was named after a 16th century Hindu poet.) It’s a very pretty name in its own right, but man, I am sick of people calling me Mirabelle. Heh. 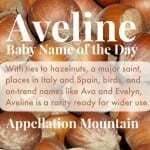 Why I am not particular found of Clementine, I do like the french word for apple, which is Pomeline or Pomellina and she would be a great sister to Mirabella. I like the Mirabel spelling better than Mirabelle, but this name is very pretty. Much more unusual than many of the other -bel names, but familiar enough to not seem weird. A very desirable combination. I’m surprised it’s so uncommon, it feels so familiar. I believe Mirabelle is the name of Fancy Nancy’s doll, chosen because it is the fanciest name Nancy knows of. This one if really beautiful and it goes on and off of my list, but I don’t think I could ever actually use it. Too fancy for me, I guess. Plus I don’t like Mira as a nickname, and I know she’d get called that. I like the idea of Miabelle better, actually… Did I just make that up? But Mirabelle definitely gets a thumbs from me! What a great name and story! Especially since it’s surprisingly underused. I’d pronounce it MEER-ah-bell (rhymes with “hear a bell”). I’d prefer the nicknames Mia, Belle and M (Em) over Mira. But I’d probably just use all three syllables of Mirabelle instead of a nickname. I also like the idea of Miri as a nickname. I like this one a lot. Mirabel/Mirabelle is lovely, and Mira is a lovely nickname. I also like a lot of the other -bel names like Amabel, Annabel, and even Isobel. But Mirabelle and Mirabella are going to be much more distinctive than Annabel and especially Isobel/Isabel/Isabelle. I love Mirabel/Mirabell, then again, i love all those Bell names. I like Clementine too, but I bet my husband would veto that for a sibling name for Mirabelle because of the character Clemmy on Reno 911. I am Mirabelle’s mom, who suggested the name for this post. What a great post – thank you, Abby! I knew the name was from the middle ages, but not about Mirabell Palace. In addition to the pop culture references Abby listed, I have to mention that Mirabelle was the name of one of the characters on Mad Men. She is the one that Roger Sterling was getting romantic with when he had his heart attack in Season 1 (one of the twins). The funny thing is, I didn’t catch that until after we gave our daughter the name. Awkward Turtle, we pronounce it as Mee-rah-bell. I remember Mirabelle from Mad Men as well. The other twin was Eleanor. I think Mirabelle is much prettier, but I liked that they both have 3 syllables. Anyway, congrats on your daughter and her gorgeous name! I love Mirabelle! It and Amabel are probably my favorite “belle” names. I’m actually surprised you hadn’t covered this one before. I thought you had covered almost all the names I like by now. Just to check is it pronounced like mirror-bell or my-ra-bell? (Also, sorry for my bad pronounciation explanation) Both are lovely though! It’s a pretty name that immediately brings the movie _Gone, Baby, Gone_ to my mind. It also reminds me of a movie I watched years ago that featured a Kiwi actor. At one point he kept talking about mirror-balls (disco balls), and it took me a while to realise what he was saying because to me it sounds like “Mirabelle”. In India, Mira by herself is a semi-popular name. I’ve seen assertions that the name means both “ocean” and “prosperous”. Very likely both meanings are somewhat correct. I think Mirabelle was the name of Claire Danes’ character in Shopgirl. It’s a little too fanciful for my taste, though certainly preferable to Miracle. I prefer just plain Mira. Mira Isabelle is the name we have picked out for our May baby if it’s a girl. 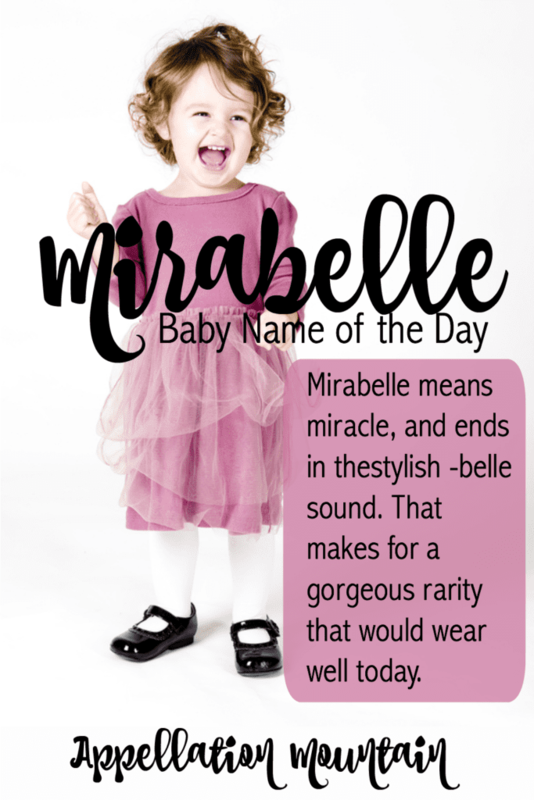 And I keep saying that I’m going to use Mirabelle as a cute nickname for her so I am so happy to see this posting!!! The kids and I love to watch Mama Mirabelle’s Home Movies on PBS – an animated show in which the title character is an elephant that shares her home movies to help teach kids about different animals. My three year old loves it, and it’s actually helped the name feel more accessible to me. I dig Mira, and find Mirabelle sweet, but in that petname kind of way. What a lovely name! I am very surprised that it is not picking up in popularity.